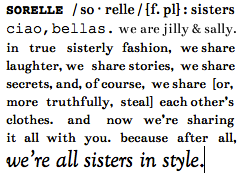 What do you get when you combine a blizzard, Sally's enviable nail polish collection, and hours spent on Style.com?! 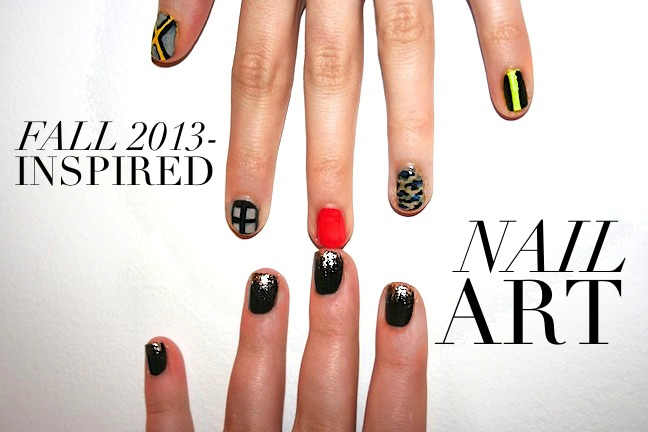 Fall 2013-inspired nail art. While we'll have to wait patiently to get our hands on our favorite Fall collections, we're wasting no time celebrating their runway debuts.. 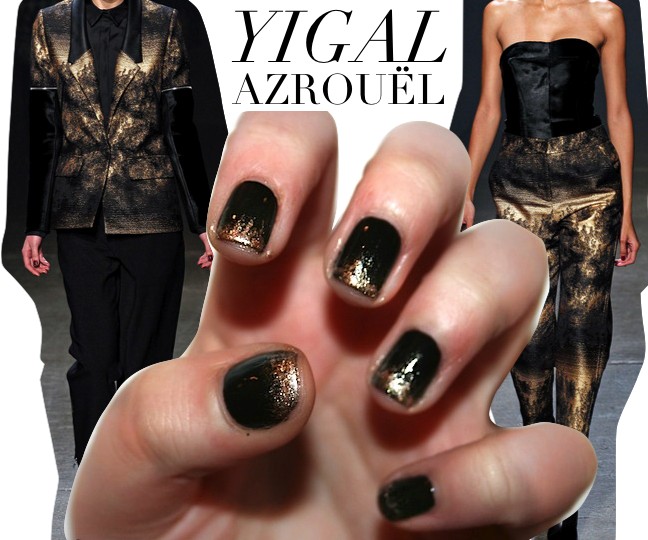 While we both fell for the outerwear at Yigal Azrouel, we spied a few metallic pieces that were equally as dazzling! 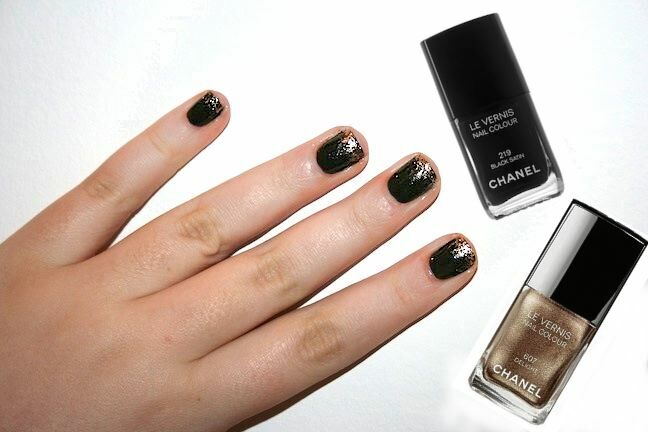 Sally worked her nail art magic into a glittery black-and-bronze ombre to recreate the print. It's safe to say we want every single piece that walked the Rebecca Minkoff runway. From that gorgeous leather-sleeved, fur-collared, yellow-lined coat, to the camo print and pops of color, the collection did us Minkettes proud, and served up tons of nail inspiration! Runway images via Style.com, edited by us. I love these! That second nail art look is perfection! Oh whoa! Such an awesome post. I lov ehow you've put this one together. It's so artistic, and so well-thought out. The little gif is perfect too! It's so inspiring how much work you guys put into this blog. and yes yes yes! the leather-sleeved, fur-collared, yellow-lined coat is out. of. this. world. really to die for. And your nail inspiration might even be just as good. Marvelous darlings, Marvelous. I loved this post...it is was fun to read plus it was creative! 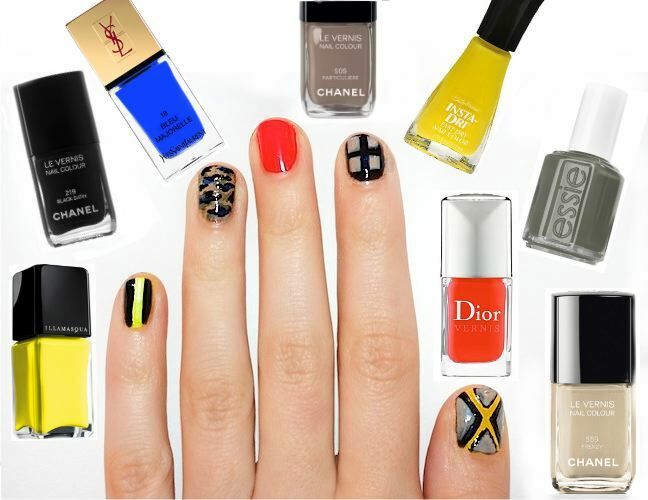 I loved the way you showed different nail art ideas that correspond to the hottest NYFW shows! :) great idea! Great nail art :) I prefer the black with metallic. 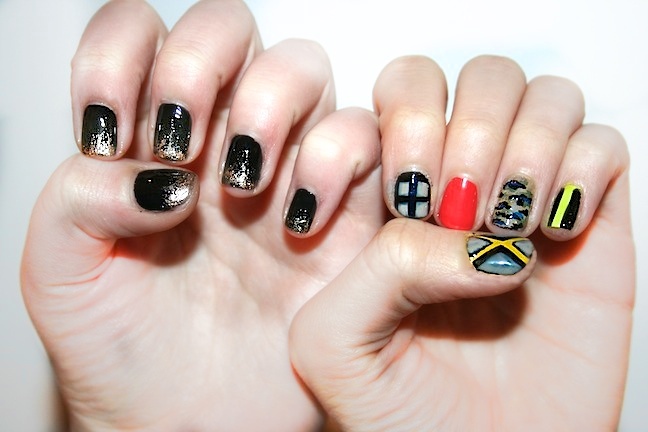 I love the black and golden color nail art very much I will this soon on my nails. beautiful art. thanks fr this post. This is such a great and different spin on FW! I love your post, awesome work! The nail trends are very creative and great inspiration from #NYFW. Fabulous Nails and style for the evening.